Packaging is a discipline that evolves constantly and few aspects of packaging are changing as quickly as bioplastics. The speed of change in the bioplastics space is cause for some of the confusion that often surrounds the topic. But a lot of misunderstanding is simply due to the fact that it’s an incredibly heterogeneous space. At first glance, the bioplastics category can seem incongruous, containing materials that are either biobased or biodegradable, or both. This translates to novel chemicals like PHA, “drop-ins” like bio-PET that are recyclable, and “old economy” bioplastics like rubber, gelatin, cellulose, and linoleum that were introduced before the availability of petrochemicals. Today, these old economy materials make up 17 million tons of the total 18.9 million tons of global bioplastics production capacity. 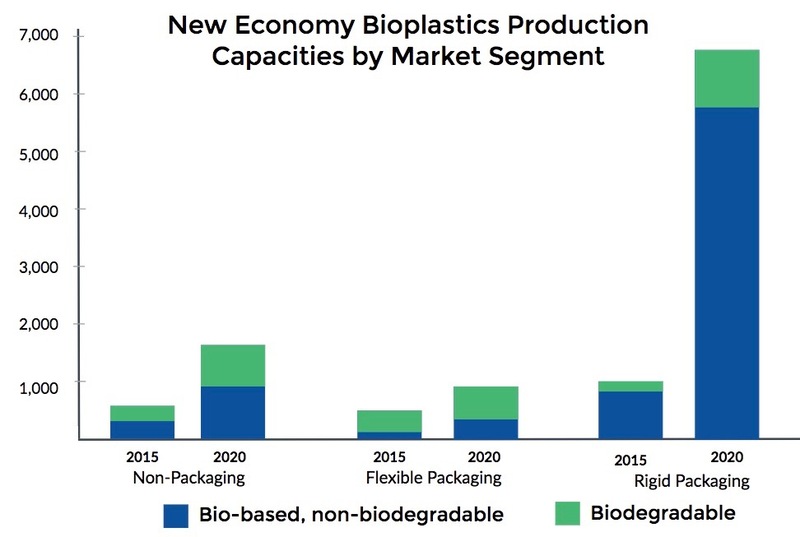 Though a minority of the current market, the production capacity of new economy bioplastics has increased consistently, clocking in at approximately 15% annually from 2013 to 2016. The subset of new economy materials consists primarily of either drop-in bioplastics that have chemically identical structures to conventional plastics like PET or PE, as well as new formulations like PLA or PHA that have chemical structures unrelated to conventional plastics. Appropriately, many drop-in bioplastics that mirror conventional plastics can be recycled just like their petrochemical counterparts. A PET bottle made of petroleum is recyclable, and so is a PET bottle derived from sugarcane, corn, or potato starch. 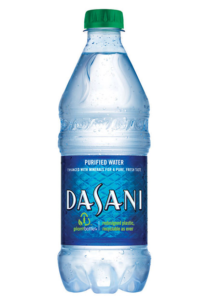 A PET bottle that contains a mix of petroleum and plant-based feedstocks, like the Dasani and Coca-Cola PlantBottle that includes 30% bioplastic content is also just as recyclable (with cap on, please). Just like conventional plastic packaging too, bioplastic packaging can have a recyclable base material, like bio-PE, but be made unrecyclable through problematic adhesives, coatings, barrier layers, and colorants, among other factors. Some bioplastics that are biodegradable are also biobased and derived from plants. PLA, for example, is fit for composting at industrial composting facilities and is created either by fermenting sugarcane or sugar beets or through the hydrolysis of wheat, potato, corn, or other starches. Other biodegradable plastics are not bio-based, like BASF’s ecoflex®, a PBAT polymer that is industrially compostable and made from adipic acid and butanediol. Often, choosing a plant feedstock for a bio-based plastic, whether biodegradable or not, is predicated on geography. In some regions, feedstocks like corn are abundant and cheap. In others, sugar beets are plentiful. Corn starch is the primary feedstock for PLA in North America, cassava is used most in Asia, and sugarcane throughout South and Central America. NatureWorks, for example, sources the corn used to create its Ingeo PLA polymer from the 300 miles surrounding its Blair, Nebraska facility. Apart from availability, other considerations like water and land requirements to produce one ton of a given feedstock are important, as is the tons of feedstock required to produce one ton of bioplastic. To produce bio-PE, for instance, sugar beets require 5 times less water and a 6 times smaller land footprint than wheat per ton of feedstock. On the other hand, only 10.86 tons of wheat are needed to produce 1 ton of bio-PE while 27.25 tons of sugar beets are necessary to produce the same quantity. 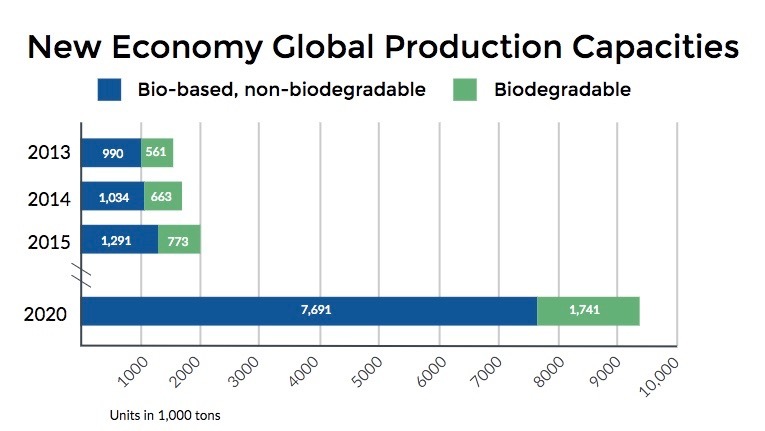 Today, the portion of new economy biobased production currently exceeds that of biodegradable plastics. The ratio has magnified in recent years, and projections strongly suggest that this chasm will increase considerably towards 2020 and beyond. The Institute for Bioplastics and Biocomposites’ 2016 report quantifies that in 2015, 37% of new economy bioplastics were biodegradable and 63% were biobased, but non-biodegradable. By 2020, however, biodegradable plastics will represent 18% of bioplastics production and bio-based, non-biodegradable plastics will rise to 82%. This is not to say that because biodegradable plastics will make up a decreasing percent of all new economy plastics production that the production itself is decreasing. From 2015 to 2020, biodegradable plastics will see an estimated annual growth rate of 25%. Over these 5 years, biodegradable plastics use in non-packaging applications are expected to increase in textiles, agriculture and horticulture, as well as the automotive and transport sectors. In a few categories, the dominance of biodegradable plastics and non-biodegradable, bio-based plastics will flip. Consumer goods, for one, is majority sourcing from bio-PET and other bio-based plastics, but by 2020 is expected to invert and be very heavily oriented towards PLA and starch blends. 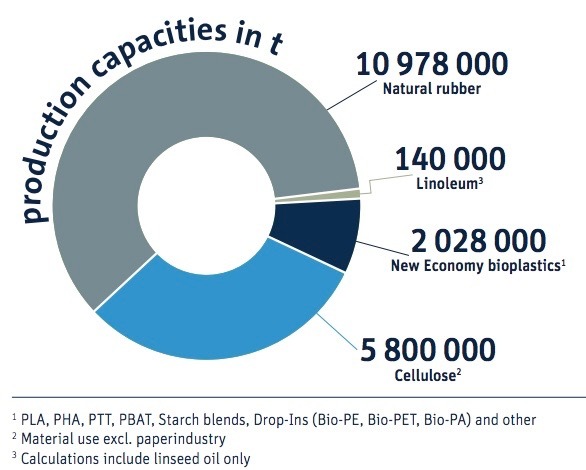 In contrast, the majority of bioplastics used in the automotive and transport sectors in 2015 are a cocktail of PLA, starch blends, and various other biodegradable plastics. Within 5 years, bio-PET and bio-PE will be used almost exclusively within bioplastic applications to this sector. Overall, however, the majority of bioplastics production capacity will be in packaging. Flexible packaging and films in particular will experience a two-fold increase from 400,000 tons in 2015 to 814,000 tons in 2020. Yet, the majority of development will take place in the rigid packaging space where the 1 million ton production in 2015 will increase nearly 7 times to a whopping 6,897,000 tons by 2020. This non-biodegradable, but bio-based plastic will be mostly bio-PET 30, or PET rigid plastic with 30% bio-based content. Within the rigid packaging bioplastic growth, biodegradable plastics will increase from less than 200,000 tons of production capacity in 2015 to more than 1 million in 2020. The industry production expansion makes sense when examining the corporate goals of large multinational companies and new government policies. France became the first country to ban single-use food serviceware made of conventional plastics in 2016. Starting in 2020, all single-use food serviceware will not only be required to be compostable, but home compostable, spurring new research and development for compostable plastics capable of biodegrading at lower temperatures typical to smaller residential-scale piles. This alone will drive many billions more units of compostable bioplastic items to the market and will be significantly augmented by new Italian legislation that mandates a similar home compostable serviceware requirement. Large multinationals in the consumer-packaged goods space and elsewhere have also made progress or declared intentions to dramatically scale bioplastic use. Coca-Cola, already one of the biggest purchasers of bioplastics, has scaled bio-PET content to 30% in their PlantBottle. The company aims to continue increasing bio-PET content across more than 30 of their global brands. PepsiCo has also made commitments to using biobased plastics in packaging. Vice President Roberta Barbieri strikes a similar note, explaining that because of the “tremendous greenhouse gas reduction benefit from bio-resins… A move to bio-based PET for our PET bottles would be a hugely impactful GHG reducing effort.” This strategy would roll up into PepsiCo’s Performance With Purpose goals, one of which is to “reduce greenhouse gas emissions across our entire value chain… by 20 percent in absolute terms by 2030.” Similarly, PepsiCo is doubling down on compostable films for its snack food packaging applications with many active pilots around the world and significant investment in Danimer Scientific to co-develop biodegradable PHA film, produced by microbial bacteria fermenting organically sourced oil. As a whole, PepsiCo has committed to distributing entirely recoverable or recyclable packaging by 2025. Exploration certainly isn’t halting here, however, and investment in methods of transforming carbon dioxide into lactic acid, as well as methane into lactic acid, is underway. Producers of PLA are developing technologies to facilitate this process with the aim of turning greenhouse gases into compostable polymers, pushing New Economy bioplastics to new heights. Other research efforts are underway to convert materials like blood meal and feathers in addition to other animal waste products at the University of Waikato in New Zealand. Though plant proteins have long been converted to plastics, animal proteins have typically clogged extruders, University of Waikato chemical engineer Dr. Johan Verbeek discloses that “The process we’ve developed gets around that problem.” In the Netherlands, Wagenigen University researchers are forging bioplastic produced from seaweed, exploring ways that Europe can increase sustainable aquaculture where the region is only currently responsible for 0.5% of the 20 million tons of seaweed farmed globally each year. Investigating other unconventional feedstocks, the Spanish company Ainia Technology has spent 4 years developing compostable PHB derived from the wastewater of fruit juice producers. Dr Ana Valera, associated with the Ainia project, shares that “The juice industry generates a lot of wastewater streams: for cleaning the fruit in different points, for cleaning the equipments used for manufacturing the juice, etc.” But, of the many options, the stream with the highest load of sugars, “was one from the cleaning process after the juice manufacturing.” While not yet tested in a pilot plant, the project represents an enticing plan to introduce food waste back into the economy as a circular material. While mostly in beta phases, this incredible diversity of R&D in new feedstocks, particularly feedstocks like waste and emissions, reflect a strong commitment to getting materials that are currently escaping the circular economy back into a loop. The excitement that this generates is understandable. Yet, it should not eclipse parallel measures for packaging producers and brand owners to make space in their portfolios for recycled content. 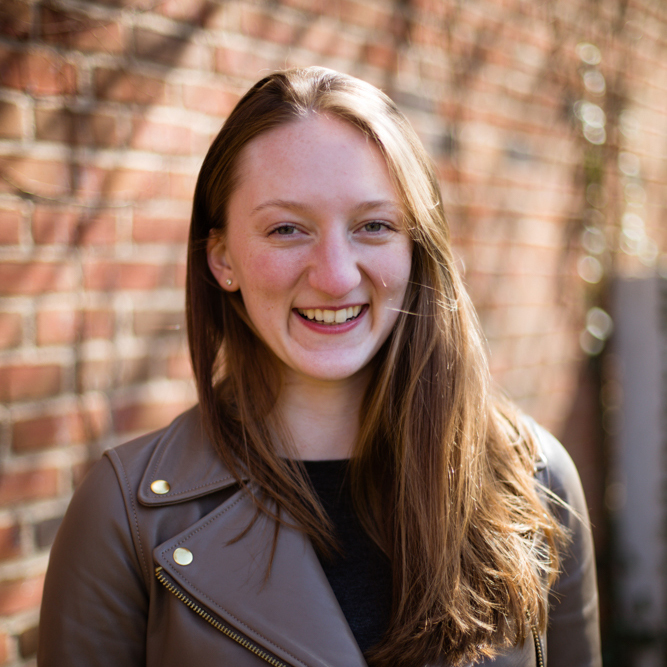 Similarly, it’s critical to ensure that even when using a bioplastic that no confounding colorants, inks, labels, adhesives, fillers, barrier layers, or other amendments are made that compromises the recyclability or compostability of the package. And, as new economy bioplastic production increases year by year, the industry must make renewed efforts to communicate clearly to consumers. The rising tide of bioplastics as a whole underscores unique ways to sequester carbon, transition from petroleum-based plastics, and create new products from waste. So, as research and production expansion occurs, the frenetic growth of bioplastics must also be tempered with reinvigorated communication to consumers about end of life, as well as renewed emphasis on sustainable sourcing as bioplastic feedstocks become more varied and logistically intensive. In all likelihood, responsible application of bioplastics in packaging and elsewhere will continue to lower cost and increase efficiency of production, catalyzing the transition to fossil-free packaging.